I don't think it had ever happened to me to be completely blown away by the aesthetics of a game as it happened for Hitman GO by Square Enix when I saw it during the TouchArcade live stream on Twitch. After playing most of it I'd say that the puzzles are a bit on the easy side, and tend to be repetitive, but I certainly find it enjoyable enough to want to complete it (and wait for new levels to be released). If you follow gaming news, you have probably read about the big drama spurred by the developers of Threes!, who posted a detailed history of the development of their game, to show how long it took them to create it, compared to how quickly it was copied. It's a very interesting read, especially if you are a game designer, so I'd encourage everyone to take a look at it. Threes might look simple, but the process that bought to its final state was far from simple. 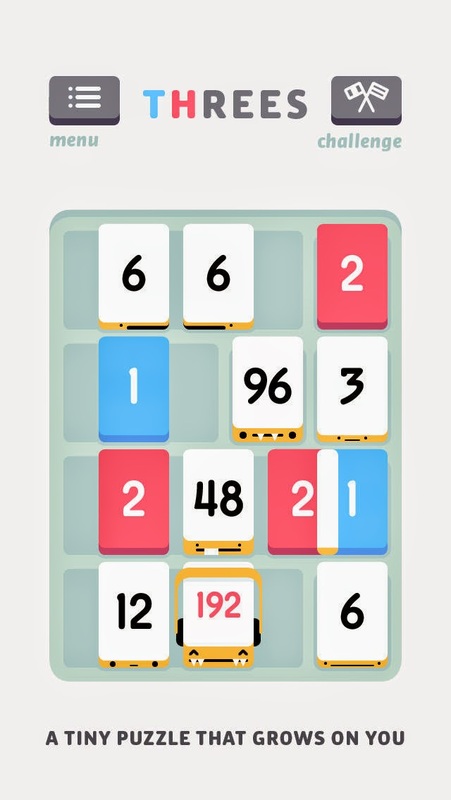 The one thing I don't like about this story is how all the attention has been put on 2048, calling it a rip-off of Threes. This post was initially going to be about how I don't agree with that, but attempting to prove my point I turned it into a collection of real clones of Threes, so I'll focus on those for now and talk about 2048 another time.